Between 2008 – 2017, there were “3,209 less Bermudians working, 3,513 less foreign workers, and $60 – $70 million tax revenue less per year,” according to a presentation shown during Government’s recently held Pre-Budget meeting. 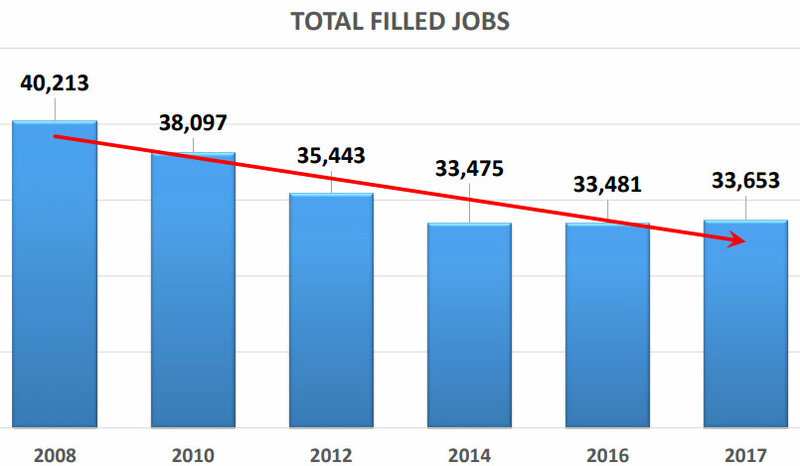 A chart contained in the presentation shows that filled jobs dropped from 40,213 in 2008, to 33,653 in 2017; a decrease of over 6,000 jobs in the nine year span. 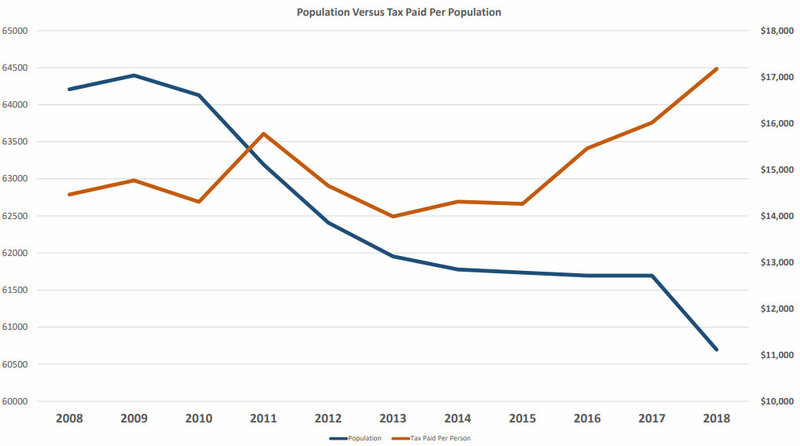 The presentation also included a chart showing the impact of the population decline on the amount of tax paid per person, indicating as the population falls, the amount of tax paid per person increases. The presentation also included a chart on the national debt, which sits at close to $2.5 billion. The presentation noted that some of the policy options under consideration for the 2019/20 Budget include taxing commercial and residential rents in line with the recommendation of the TRC report, increasing the Foreign Currency Purchase Tax [FCPT] from 1% to between 1.25% to 1.75%, and amending the land tax rate structure for residential properties by increasing the taxes for properties with an ARV of under $22,800, to a flat rate of $250 per annum. 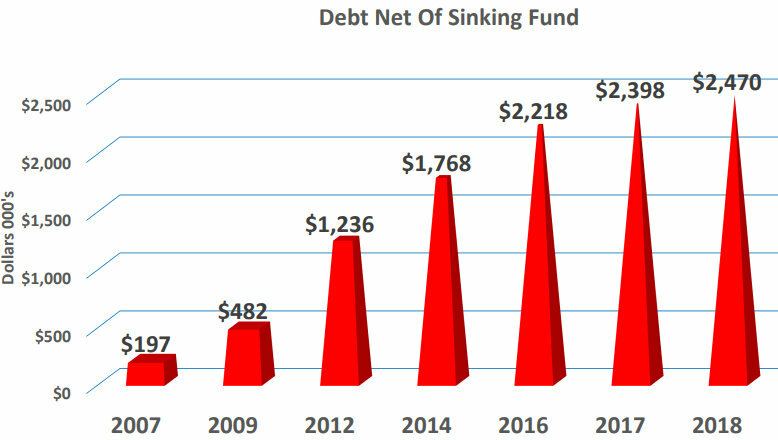 Looks at the chart showing net debt. 5 shorts years for the PLP to put a two billion dollar millstone around our necks for generations to come. Two billion dollars. Meanwhile chasing off 6000 jobs. Utterly clueless and inept. And this is what we voted for? I didnt vote for this immature government. Their pre-election behaviour was straight up problematic and gave me no confidence in their capacity to govern. Anyone can throw race baiting screaming rallies. Management of a country’s affairs is a whole different ball game. However, the majority got hoodwinked into believing their emotional hype. They now sit silently in pure embarrassment. They got what they voted for. And they are feeling the result of their immature voting. Bermuda for Bermudians = Bermuda for Dr Brown because he’s the only one better off under this Pee El Pee gov’t. $2.bn in debt and how many people can say they are better off now than they were in 1998? I bet very few!! Yep. If you looked at the number of jobs in 2007 and in 2013 (i.e. right at the end of the PLP government) the number of jobs lost was more like 7,000. They have cherry picked many of the numbers here. 2013 is a much fairer measure of where the PLP left things. It takes a special kind of stupid to “achieve” those figures. And there’s no hiding, no option to finger point, this is entirely on the PLP. 16 0f the last 20 years folks. Personally, I do not believe that this talk is anything but a tactic. Scare everyone now and then do the responsible thing in the actual budget. So you have 6000 less workers but the gov departments that support any functions for these people (e.g. payroll tax and immigration) don’t get any smaller? The workload is less and yet same number of people doing it? PLP is a joke. They have NO clue. We cannot invent an industry. We cannot just ship people in for numbers. YOU chased them away. These three charts are very sobering viewing and, as they are straight forward, should get everyone’s attention. The fact that they were included in the pre-budget report is a very good thing. I consider that Premier Burt and Ministers Dickinson and Caines are well educated young men who understand the gravity of our situation. There are other good, young members of the Government such as Minister Foggo and MP’s Ming and Furbert to name just a few who also are knowledgeable and supportive. Wouldn’t it be wonderful if with bi-partisan support from some of the similarly well educated members of the opposition the younger generation of politicians had our support rather than childish name calling being the order of the day? Notice how when the tax paid per head of population rises, the actual population decreases. Has Dickinson looked at that slide? Oh, he’s smart enough to understand the predicament we’re in, even if he is coy about the root cause. The challenge will be if he can tackle the elephant in the room and do exactly what the march on Parliament prevented in the first place. Any fool can increase taxes and spend other people’s money. That’s all this lot know. And the gullible electorate voted them back in. It makes the PLP election mission statement more laughable. It’s pretty bland – I mean who wouldn’t agree with it’s stated aim…it’s just that there isn’t any delivery. No action. Beyond the bickering and all our petty resentments, there is only one workable way out: lower taxes, lower barriers, lower regulatory policies (casinos, planning, offshore business – tell the EU to get stuffed), shrink the civil service and there will soon enough be jobs, jobs, jobs. Their economy is booming, while Bermuda’s withers on the vine. Why do you reckon that is??? “Fiscal discipline with sensitivity”. Has to be the joke tagline for the year, so far. A 10% reduction in Government costs is easily achievable if they were told it had to happen. That would stave off an increase in taxes hitting the private sector. Taxes to pay a bloated Government that has the same number, if not more staff now than in 2008 yet the private sector has shrunk by around 6,000. A Government that cannot run a bus service, provide quality Education or affordable healthcare. I am curious how and why an already enormous debt doubled under the OBA government? They strike me as just as inept as the PLP government(s). It didn’t double under the OBA. It did go up by 6x under the PLP though. Are you also curious as to why the tide goes in and out? Took out an advance loan at a lower fixed rate so that they would not have the enevitably take out more loans at an increasingly higeher rate. Simple finance really. Somehow they had to pay off all the contract, consultants and project over runs the PLP initiated. Being able to project a fixed cost allows you to actually balance the budget rather then guesstimate it. Yeah, because comparing a Party that inherited a small and manageable deficit who turned it into a $400mn annual deficit which the other Party inherited when they assumed power is definitely an apples to apples comparison huh? Another local financial genius I see. It doesn’t take a genius to analyze these graphs and see what’s wrong if you understand our immigration laws haven’t evolved for a very long time. The PLP needs to stop wasting time and get immigration reform done and dusted. Hopefully the opposition won’t be smug and have an “ I told you so attitude”. No need to respond to this post as I am aware that I am completely deluded but nevertheless the solution is that simple.